Geoscience Australia and Deep Exploration Technologies Cooperative Research Centre (DET CRC) have reached agreement to collaborate on regional drilling to reveal the hidden mineral potential of Australia‟s buried but prospective geology. The new agreement will facilitate the deployment of transformational technologies for successful mineral exploration though the cover rocks obscuring prospective geology. Australia’s share of global mineral exploration expenditure has dropped from 20% in the 1990s to ~12% in 2013. This decline has paralleled a decline in discovery of new major mineral deposits over the same period both in Australia and world-wide. Decreasing mineral exploration success and expenditure in Australia reflects the fact that relatively easy-to-find mineral deposits with a surface expression have largely been discovered. New mineral provinces must be found hidden beneath barren cover rocks and new technologies are needed to search more efficiently and effectively. During 2014, DET CRC will manage a drilling program on behalf of Geoscience Australia and the Geological Survey of Victoria in the Stavely Zone of western Victoria. Through this drilling program, Geoscience Australia and the Geological Survey of Victoria will seek to test a new geological interpretation of the region and to uncover the key geological indicators of potential new mineral provinces hosting metals such as copper, gold, nickel and base metals. DET CRC will deploy conventional diamond drilling, together with for the first-time, new real-time sensing technologies both downhole and top-of-hole. 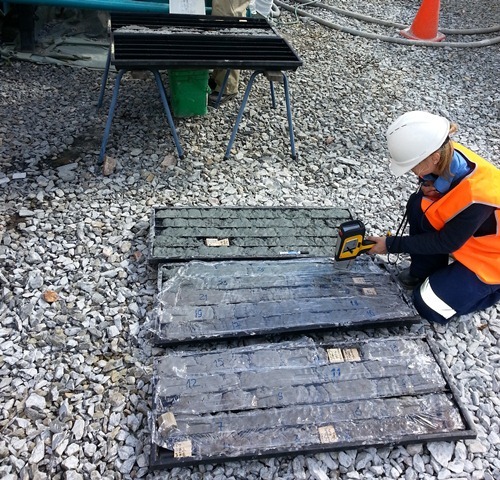 DET CRC will, for example, in collaboration with partners CSIRO, Imdex and Olympus deploy its Lab-at-RigTM analytical system providing geochemical and mineralogical information on drilling samples as they are recovered. The data will be uploaded to the internet for real-time, remote access. Such new technologies seek to inform drilling decisions and, in due course, to replace time- consuming and expensive lab-based assays of drilling samples.